My feet were killing me after the tremendous walking at Taipei Flora Expo. This is what happens when you don't workout regularly. 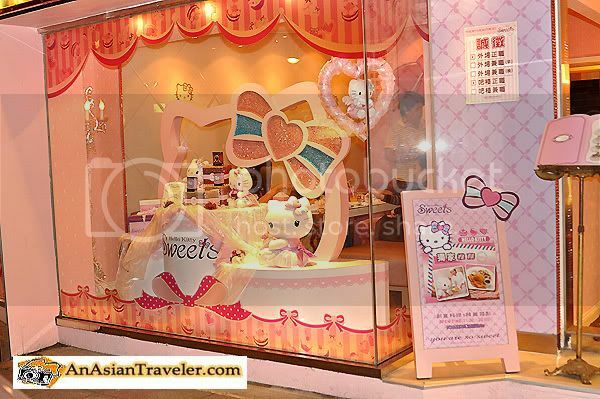 :) But our day didn't end there, the Hello Kitty Sweets Cafe was next on our itinerary. Unfortunately though, we totally picked the wrong time to go. As we approached the place there were hordes of people waiting inside the restaurant. A waitstaff manning near the entrance told us that we had to wait for a table. Apparently, the restaurant is popular with tourists and locals alike. All are welcome regardless of age. I was quite hesitant but HB was determined to wait. 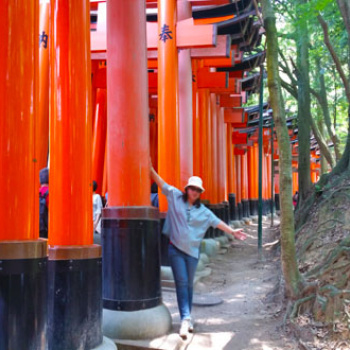 I decided to hang around outside and observed the daily typical street life. 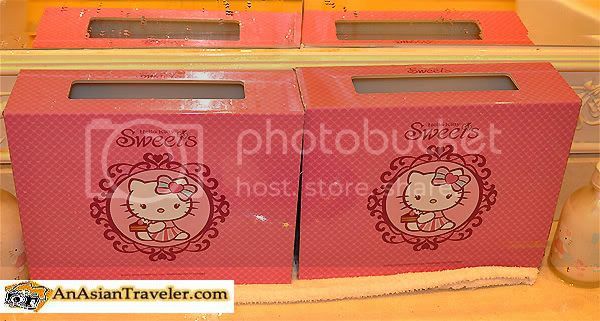 I noticed quite a few shops and a hotel in the area and thought I'd take some photos for you lovely people to help you locate the Hello Kitty Sweets Cafe in case you want to visit. 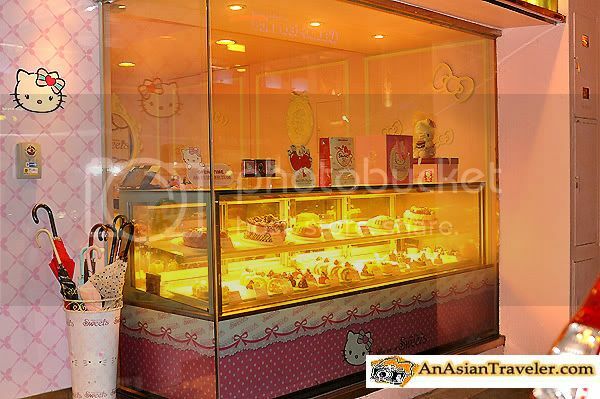 Without the huge Hello Kitty signage, the cafe exterior doesn't stand out in particular way. It looks like an old house turned into a restaurant. I was appalled at having to wait over an hour for a table. 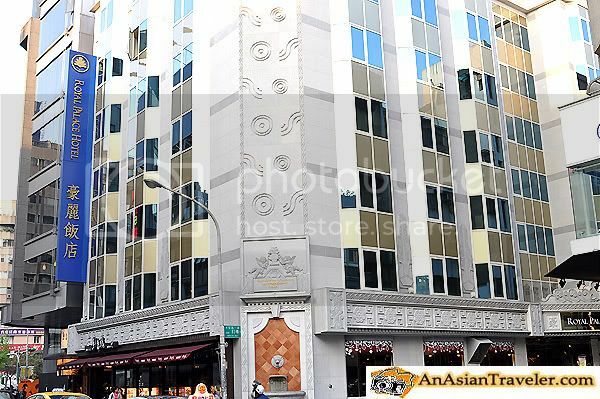 Anyway, once we were in, the waitress ushered to a curved staircase leading to the second floor dining room. 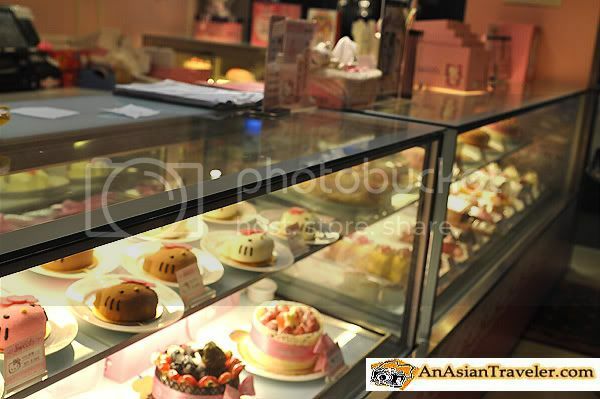 It's a cute restaurant with low intensity lighting, decent hello kitty decors and cute different shades of pink. 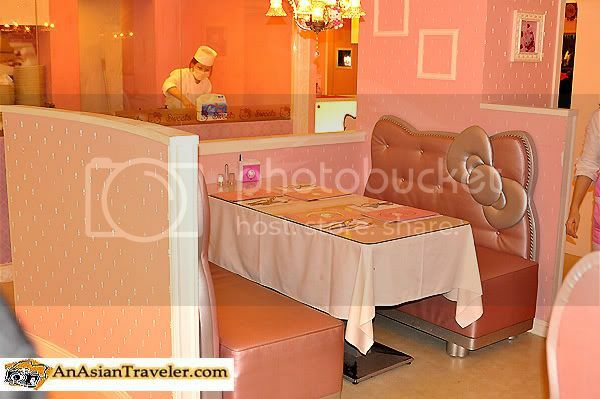 In addition to that, all the young female waitstaff are wearing hello kitty pink uniforms which I enjoyed looking at. I was put off from the start when I saw our table. I didn't like the tight seating arrangement so we asked if we could sit at a nearby vacant table which was a bit more spacious. However, she declined our request. Then we were told that we had a time limit on our table and had to be out within a set time frame. We were compelled to go back and I sat on a long sofa bench (built into wall) SHARED by the rest of the four tables. I noticed we sat next to pairs of young lovers. It was like a speed-dating kind of scenario where ladies seated in the same row while men on the other side (as if they're going to rotate between tables when they hear the bell). Another drawback which I mentioned earlier, our long row of small tables were placed so close together that I had to turn sideways to get into the bench seat, and I could practically touch the person sitting next to me without even stretching my arm all the way out. We were like cramped together to say the least, and basically made the atmosphere suffocating. Frankly, I don't really care if we have to wait for over an hour as long as I can have the table that I want. Don't get me wrong folks, I'm not a prima donna by any means, I wasn't raised that way. I just want to feel comfortable while enjoying my food. Is that asking too much? 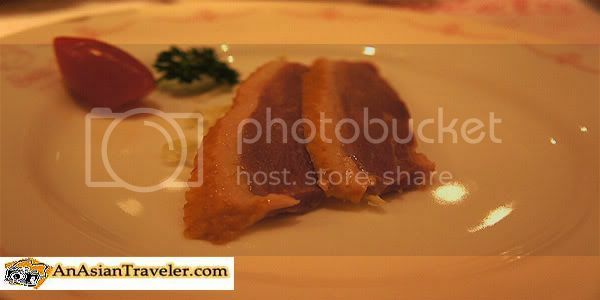 Once we got settled, the staff handed us the menu and we were also informed that there was a minimum consumption of NT$300 per head. 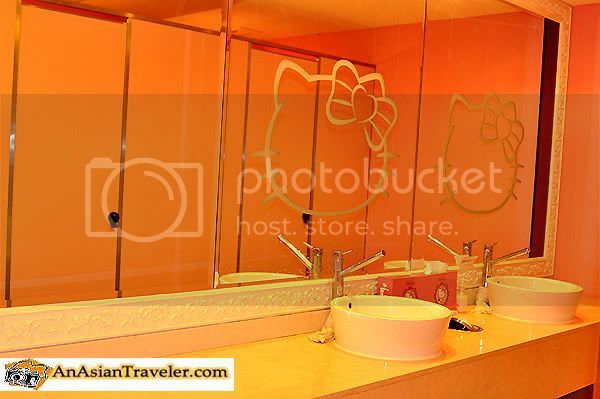 While waiting for the food, I spent most of my time hanging around at the ladies restroom checking out the kitty stuff. 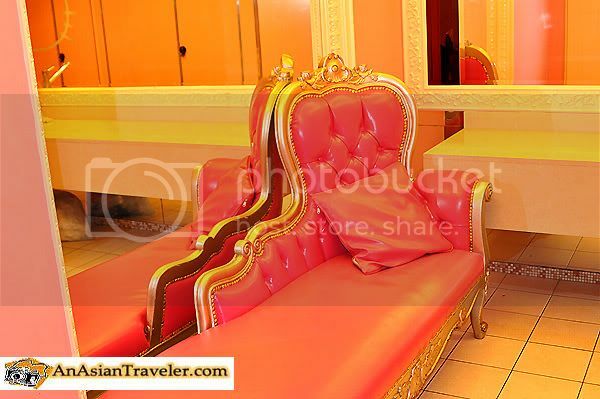 Then I casually sat on this cute pink sofa (Yes peeps, you read that right, a sofa inside the restroom!) and I unintentionally started to observe the people coming in and out. And I saw a few guys walked into the ladies restroom! Oops! 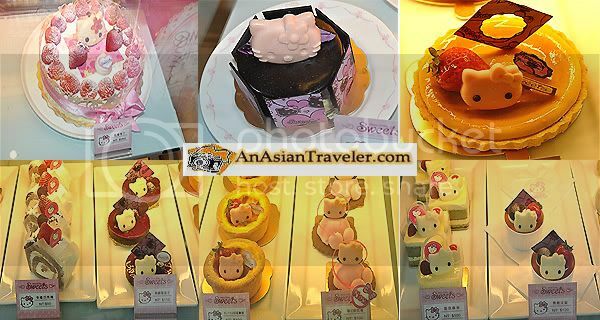 Back to the menu, they have some interesting and fancy variations of the hello kitty dishes. I was thinking of a la carte meal only. 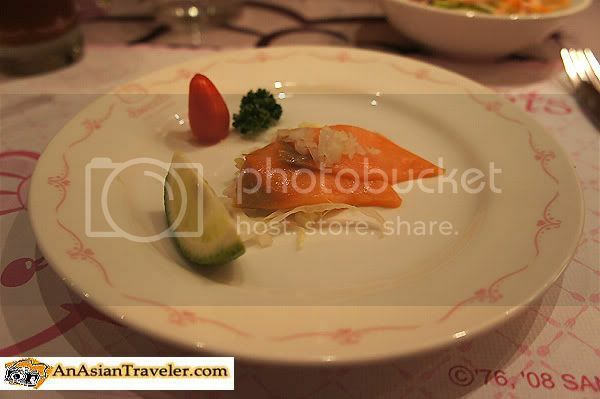 But I was surprised they served us a five-course meal. 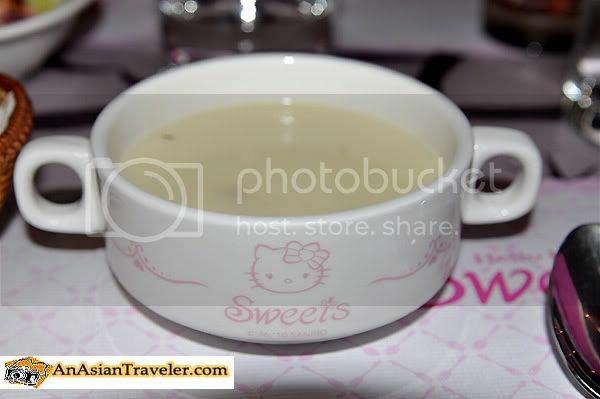 Iced Tea was served first in a tall hello kitty glass. 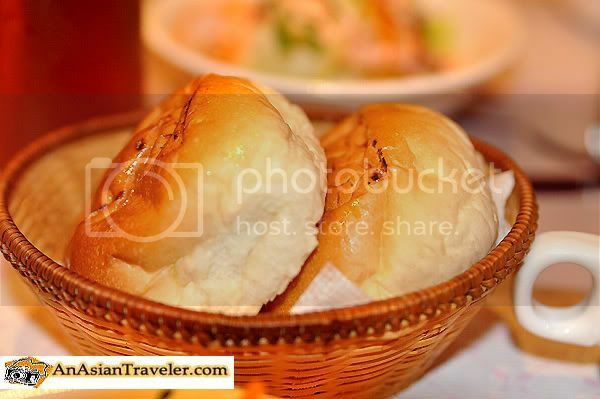 Next we received freshly made bread and simple salad with a good dressing. We then get a soup. Then of course, came our main entree. 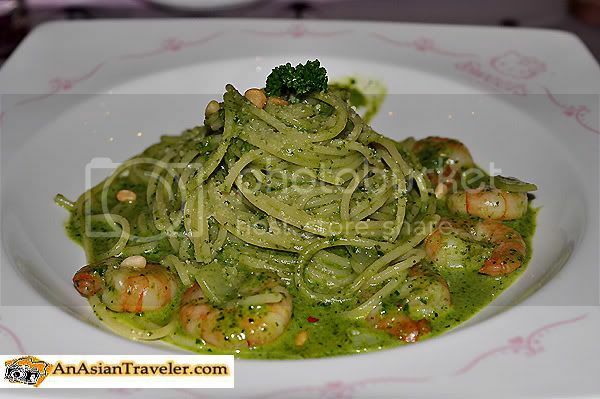 HB ordered the shrimp pesto pasta with sprinkled pine nuts and fruit. 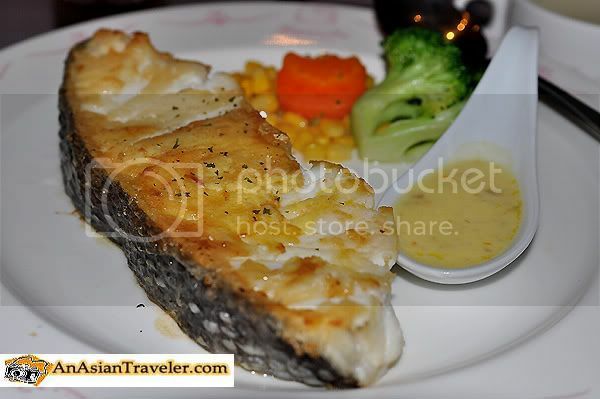 I chose a junior fried white codfish. It was a bit bland but the cream sauce was great. 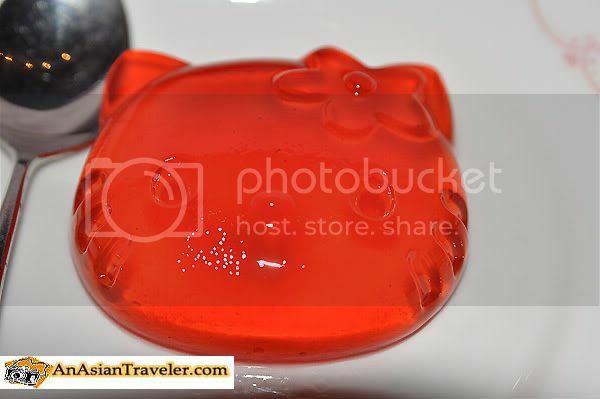 To end our meal, we were presented with a hello kitty red gelatin dessert. Overall, food was okay. Nothing impressive but it was enough to satiate us. We paid the bill at the cashier area near the entrance of the restaurant. 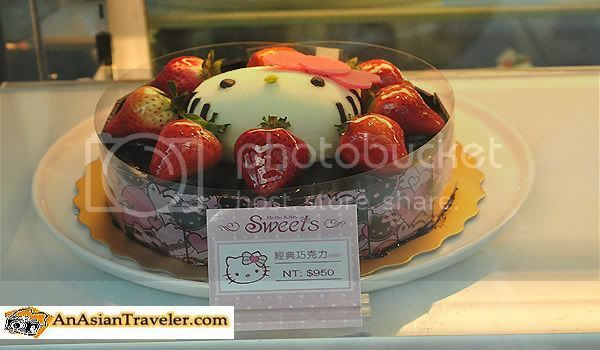 The part I should rave about is the hello kitty desserts. 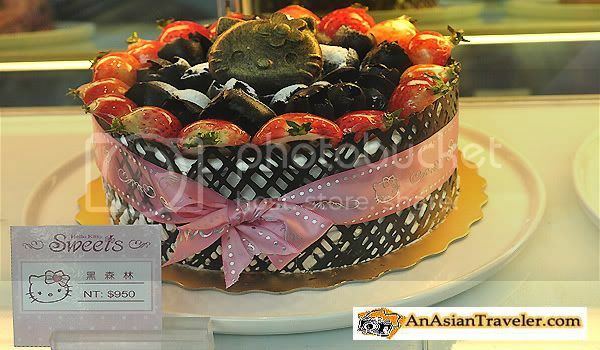 The stunning embellishments and intricate details on a cake alone are well worth for a trip here. It's like there is so much passion from the chef who created these. I was planning to get some takeout but HB reminded me that it must be consumed immediately within 20 minutes. A bit sad, I just completely satisfied staring in awe at how delightfully intoxicating they all were. 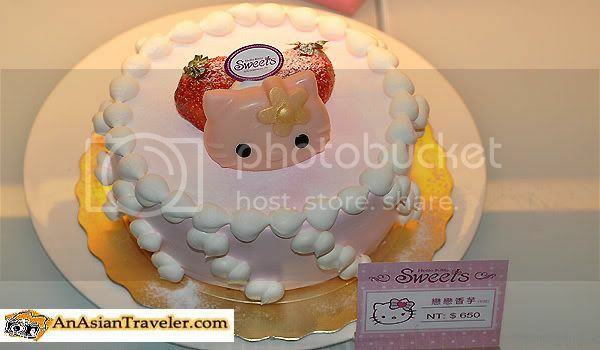 I'm really torn writing my not so kittirific experience because I love Hello Kitty. Perhaps if we had come at a slow time of the day or if we were seated at a larger and comfortable table (like the photo below) my dining experience would have been completely different. 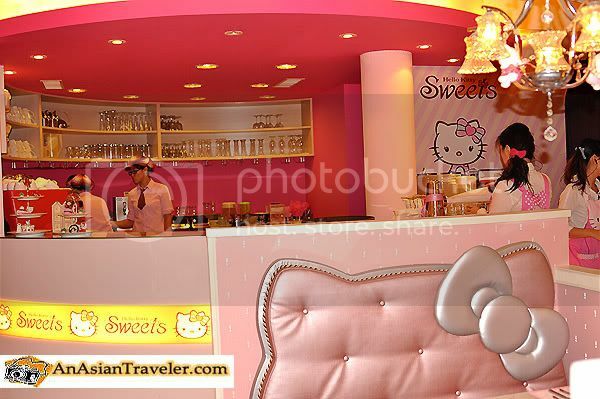 If you asked me, I would say, Hello Kitty Sweets Cafe is a nice place to go with a bunch of friends like four or six so you can choose the large kitty tables and enjoy cam-whoring. 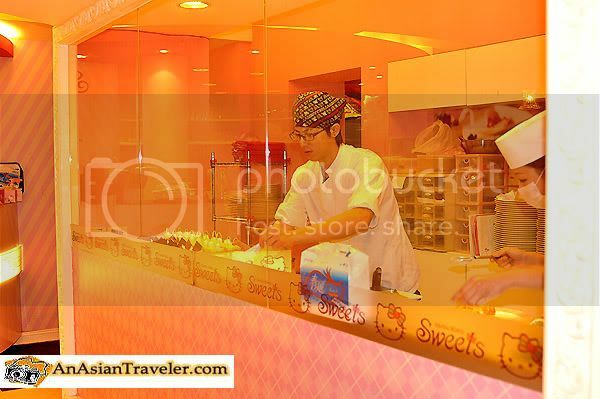 Here's a super cute video of the Hello Kitty Sweets Cafe. 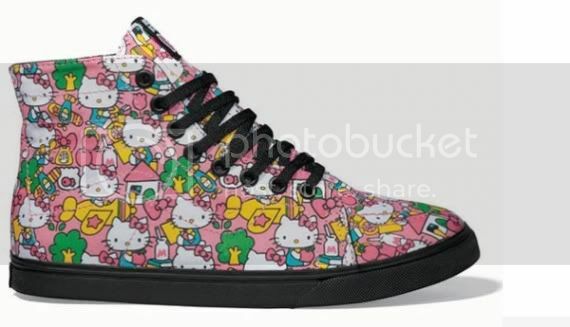 On a different Hello Kitty side note, I spotted this super cute collaboration between Hello Kitty and Vans on the web. According to what I read these sneakers will be out on June at shop.vans.com, sanrio.com and authorized stores. 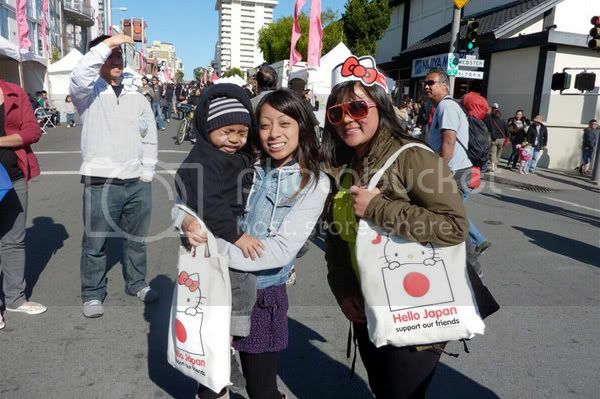 Another worth mentioning is the Hello Kitty Japan Relief Printed Canvas Tote. It's US$10.00 each, and the 6.50 from the sale will be donated to the Red Cross relief efforts in Japan. 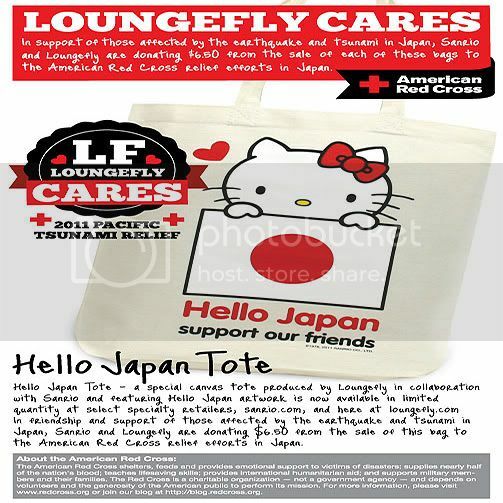 You can buy this at loungefly.com, sanrio.com and selected specialty stores. 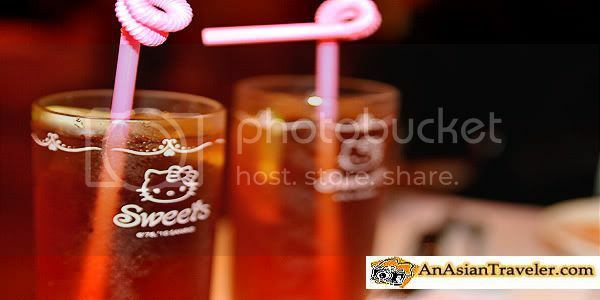 Its yummy to see all sweet. 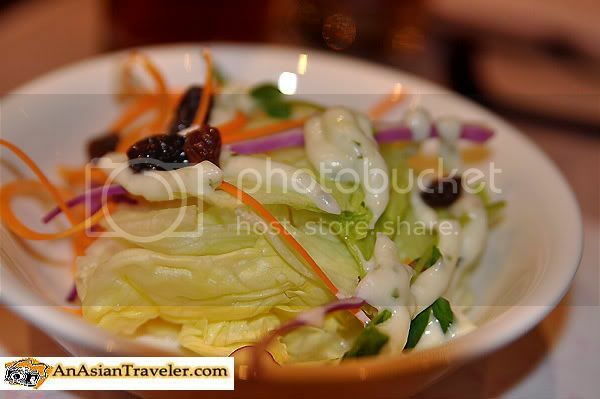 I love to eat and my mouth is watering.
) Thanks for the great read. Keep it up! Wow! 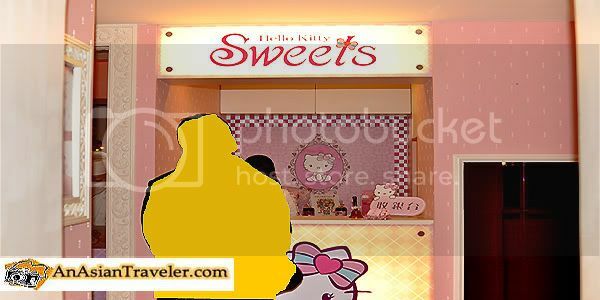 ang ganda naman sa jan sa Taipei kaylan kaya ako makakapunta jan ang cute din nung mga picture puro hello kitty favorite ko kasi c hello kitty. Great post! I wish to bring my baby there someday. She loves Hello Kitty. i love sweets and i hope i can visit taipei!!! i've heard about this from 2 bloggers i know. 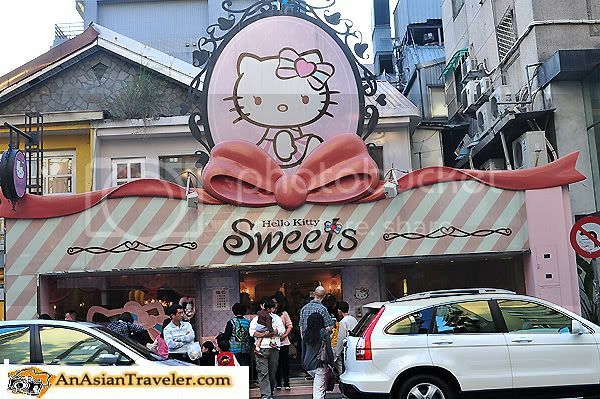 i believe that there are only two hello kitty sweets cafes in asia-in taiwan and the other is in south korea. i'm so jealous that you've already been in one. can't wait to read your posts about Malaysia and Singapore as we are about to go there in a few months time.